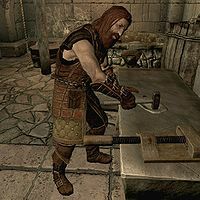 Gunmar is a Nord blacksmith added by the Dawnguard add-on. He initially wears a set of scaled horn armor with matching pairs of bracers and boots. He is equipped with a leveled one-handed weapon, and carries random leveled bandit loot, and has a 25% chance of carrying 1-9 gold. Once recruited into the Dawnguard, he dons a set of Dawnguard equipment. You will be able to hire armored trolls from him for 500 gold each. He is a master trainer in Smithing, and will sell you a wide variety of armor and weapons, including Dawnguard equipment. Gunmar will be the source of most of your Dawnguard radiant quests, as Sorine Jurard's radiant quests can only be performed once, and the probability of receiving quests from Isran and Florentius Baenius is always lower than the probability of receiving quests from Gunmar. When taunting an enemy, he will use the following lines: "Justice will prevail! ", "I'm not backing down! ", "I've fought worse than you! ", and "Give up while you can!" Cleansing Light: Kill the boss of a vampire lair. Hide and Seek: Kill a vampire masquerading as a citizen. Preemptive Strike: Destroy the vampire before it turns its allies. Upon finding Gunmar, if you stand near him long enough without entering conversation, he may say: "Mind yourself. There's a vicious bear on the loose." Upon speaking to him, he will say: "You there, hold fast! I've tracked this damned bear for two weeks; I'll not let it have any more victims." You can then tell him Isran needs his help, and Gunmar will say: "Isran? Needing someone else's help? Never thought I'd hear that. I'm afraid he's a few years too late. I've moved on. I have more important business to attend to. Besides, he can handle anything alone! He assured me so himself. What could he possibly need my help with?" You can then tell Gunmar that you're up against vampires, and he will say: "Vampires? That... well, that might change things. Tell me more about what's going on." When you tell Gunmar that you're not sure, but that they have an Elder Scroll, he will reply by saying: "By the Eight... All right, look. I'll consider it, but I can't just leave this bear to prey on more innocent people. Once it's dealt with, then perhaps I'll see what Isran expects of me." Once the bear has been defeated, speaking to Gunmar will result in him saying: "Don't know how well I'd have managed by myself. You have my thanks. You've helped me, so I suppose the least I can do is find out what Isran wants. He's still at that fort near Stendarr's Beacon, I assume?" 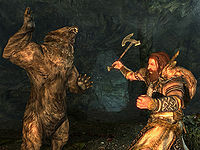 If you have killed the bear without ever talking to Gunmar beforehand, he will instead say: "For two weeks I've tracked that bear, and now find that you've killed it on your own. I'm not sure whether that makes you brave or foolish. What brings you here?" Either way, you now have two dialogue options. If you tell Gunmar that Isran said for him to meet him there, he'll respond: "Of course he did. He's been working on that place for years now. Never lets anyone in. His own little fortress. Well, I guess I'll get to see what he's been up to all this time. I'll meet you there." If you instead ask him how he knew, he will reply by saying: "If Isran is anything, he's stubborn." Either option will result in Gunmar agreeing. He will then stay at Fort Dawnguard for the rest of the game. If you listen to the interactions between members of the Dawnguard at Fort Dawnguard, you will hear a lot of discussion about Gunmar and his armored trolls. You may be told to speak to Gunmar for a new assignment, but when speaking with him he will have no new assignment for you. However, this may be a result of having a quest active already. Esta página foi modificada pela última vez à(s) 13h47min de 12 de junho de 2014.